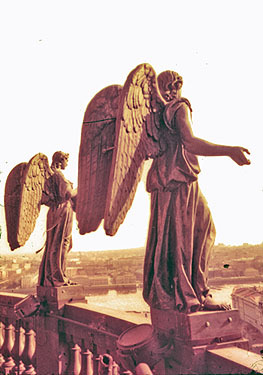 Photo of the winged angels on the balustrade of St. Isaac's Cathedral in St. Petersburg, Russia. This is the HIS 112 course syllabus (home page). On this page, you will find important information about the course and the links to the course assignment schedules. Peter von Sivers, Charles A. Desnoyers and George B. Stow, Patterns of World History, volume 2, brief 3rd edition, Oxford University Press, 2018, ISBN 978-0-19-069732-7. You can also use the combined volume, 2nd edition, Oxford University, 978-0-19-939961-1, which covers the same material. Please note that you can use this same textbook for HIS 111. If you are wondering whether you must buy the textbook, then please watch this short video. Chinua Achebe, Things Fall Apart (ISBN 9780385474542) Please note that if you do not want to read Achebe, then you can read Pramoedya Ananta Toer, Child of All Nations (ISBN 9780140256338). If you do not want to read Achebe or Toer, then you can read Amadou Hampaté Bâ, The Fortunes of Wangrin (ISBN 9780253212269). Surveys the general history of the world from about 1600 CE to the present and allows students to reach a basic understanding of the characteristic features of the world's historical development from 1600 CE to the present. Students will learn about some of the important political, economic, social, intellectual, cultural and religious changes that shaped the development of the world’s civilizations in this period of time. Establish a chronology of historical events in the world since 1600 CE. Explain the changing geopolitical structures of world civilizations up until 1600 CE. Define the importance of key individuals and developments in world civilizations since 1600 CE. Identify the social, economic and political forces at work in the evolution of the world’s modern civilizations. Recognize and describe the significance of some of the cultural achievements of world civilizations since 1600 CE. Analyze complex historical sources and materials and reach conclusions based on interpretations of those materials. All materials on this site are copyright © 2008-18, C. T. Evans.